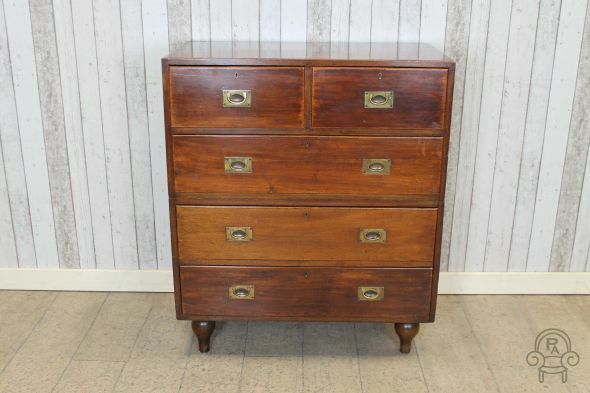 This is a lovely example of a late Victorian solid mahogany two over three campaign chest of drawers. This beautiful chest would have originally been used on military campaigns by officers and military staff. It features its original brass sunken handles and demonstrates the classic two over three design. The item splits into two pieces and boasts removable feet; this chest also comes with its original key. We feel this item is in excellent condition considering the wear and tear its experienced throughout its lifetime. It has a small repair to the rear of the chest of drawers and a small expansion crack to the lower part of the chest which is clearly displayed on the below photos. This is a fantastic example for any collector of this style of furniture.